Best place in Savannah (heck, in the nation!) to get a great tasting cake that’s gorgeous and worth every penny! I’ve used Wicked Cakes for misc. events and am so excited to now have her do my wedding cake and groom’s cake. 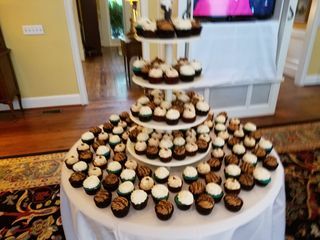 My sister had her graduation in D.C. and Abby, the owner, made cupcakes and a special cake for that occasion. I drove there but she packed it all up perfectly and it lasted! Everybody was talking about how tasty they were! 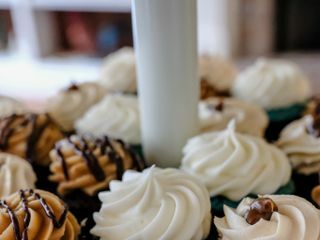 If you’re looking for a sweet treat that’s truly unique and special, you can’t go wrong with Wicked Cakes! PS My fiancé is also an avid fan, we follow her IG account and he’s always looking at the beautiful baked goods and has said he wouldn’t have anybody else do his groom’s cake! SO EXCITED! Thank youuuu Wicked Cakes! My maid of honor came to town and she, my fiancé, and I did cake tastings. It was so much fun and Wicked Cakes was absolutely delicious. They did not disappoint on our wedding day. Our wedding cake was beautiful, exactly as we had envisioned. We got lots of compliments on how great the cake tastes. I’m excited to eat the leftovers after the wedding! We only got a small 2 tier cake for our wedding for cake cutting purposes. But that didn't effect the great service we received. Abby worked with me to get the cake in our budget, and it truly came out just as I imagined it! Also tasted amazing! We got the german chocolate cake with buttercream frosting. Our guest kept coming up to us to say how amazing the cake was! Thank you so much for such beautiful work, and great service! The cake was exactly what we wanted. It was beautifully crafted and tasted amazing! The value was great, too! Wicked cakes did a fantastic job with our wedding cake. We planned our wedding from 600 miles away so I did not see their work until the day of the wedding. They worked with my florist to coordinate my requests and beautifully decorated it with the flowers at our location. We would definitely recommend them. We highly recommend Wicked Cakes! The entire staff was very helpful and quick to respond. The owners were able to take our vision and ideas and turn it into the cake of our dreams! When our topper turned out to be too big for what was planned, they quickly created a plan to resolve the situation and everythimg turned out perfectly!! 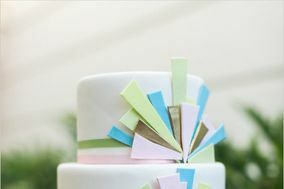 We loved working with WickedCakes for our special day. Our cake was a little complicated to make, but Wicked Cakes did an amazing job. When we finally saw the cake at the reception it took our breath away by how it surpassed our expectations. It was just gorgeous and perfect! Our tasting at Wicked Cakes of Savannah with Abby was great! We decided on cupcakes instead of a traditional cake and knew we wanted to do 3 different flavors. She pretty much let us taste however many flavors we wanted. Sadly this was directly after our caterer tasting and we were so full. 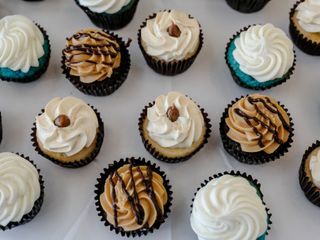 We decided on peanut butter and chocolate, salted caramel and blue velvet (same as red velvet but blue to match our colors). We also rented a cake stand from Abby. She came to the venue and set everything up beforehand. She had everything set up and displayed prior to our arrival. It was great! Our only negative is that the blue velvet was more of an electric blue instead of a navy which was our main color for the wedding. Maybe this wasn't communicated as much as it should have been. All in all - Wicked Cakes of Savannah is a MUST. We still stop in there on every visit to Savannah to get cupcakes. They are very LGBT friendly as well! THE BEST EVER!!! great services/prices/ and TASTE!!! Absolute best cake I've ever eaten and they were table to work with a shorter time frame! I did not personally pick the bakery for my wedding cake, it was a part of my elopement package and it was AHMAZING. I was thrilled to have a cake so light and tasty. The buttercream was not heavy nor tasted like straight butter. I had the vanilla/vanilla and I can't wait till my 1 year anniversary to go back to Savannah and have it again. Wicked Cakes is the best! We got carrot cake for our wedding cake and it was delicious! We also did a NFL grooms cake that was half Detroit Lions and half Kansas City and they made it exactly how I showed them in a picture. That cake was marble and was also delightful! They are reasonably priced and I would highly recommend them. We tried several different bakeries in Savannah, but we kept coming back to Wicked as our favorite. We went with the lemon blueberry which is classy and light. Wicked was fairly priced (given how expensive wedding cakes are) and came up with some creative solutions to fit our budget. Everything was delivered on time and looked beautiful. Wicked was easy to work with. Their cakes are amazing - we loved that not only did they taste delicious, but they had such fun flavors! We went with two flavors - cookie dough and funfetti. Abbey was great to work with and executed my vision perfectly. We chose Wicked Cakes to provide our wedding cake as well as a dessert bar. Abbey and her staff did an amazing job, exceeding all of our expectations. We requested a small personal cake just for the cutting, and it was absolutely stunning, not to mention delicious! We received several compliments from guests on how amazing the desert bar was, and how Wicked Cakes had incorporated our unique story by making cannolis representing New York where our families come from, and individual key lime tarts showing where we met, and many other delicious treats! We couldn't have picked a better bakery! We were so happy with how our wedding cake turned out! We had an intimate wedding of only 25 people but our two-tiered cake looked beautiful and grand on its pretty pedestal stand! It was the exact simple and elegant look I was going for, and best of all, everyone that had it then or took it to go commented on how good the pumpkin and the salted caramel were! 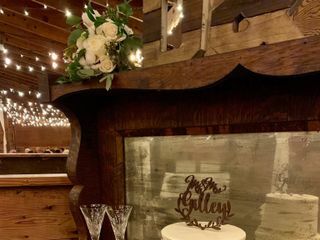 Thank you, Abby and Wicked Cakes, for helping to make our day perfect! Abby and wicked cakes is the best in Savannah area. 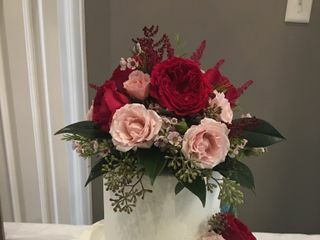 She drove up to bluffton SC to do our cake tasting and shared amazing ideas for a unique cake. Our cake was not only beautiful, it was also delicious and so unique! 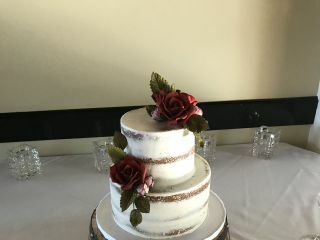 Chocolate raspberry naked cake with one vanilla raspberry section covered in a pearl finish! She also gives a small anniversary cake, wrapped up for the freezer, so the full cake can be enjoyed at the party! Abby is the best! Not only are her cakes so delicious but she is willing to work with your budget and not make you feel bad whatever amount you can afford. She is honest and such a great person to work with as she knows all the other Savannah vendors and they all love her! Wicked Cakes did a fantastic job with our wedding cake. 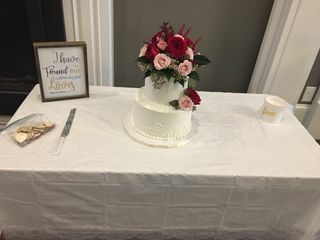 Not only did it look great and fit our space, but several guests told us it was the best cake they'd ever had at a wedding! I used Wicked for my wedding this past weekend. They were amazing!! Incredibly easy to work with. Able to do everything over email/phone since I live on SC. I emailed them a picture of the cake I liked and the one they made literally looked just like the picture and was delicious!! Couldn't have asked for anything better. Use them for you wedding or stop by their yummy bakery!! DELICIOUS!!! Simply the best cake ever! Not only was the cake beautiful and exactly what we wanted but, it was so tasty. Being able to have different kinds of cake within one was a complete success. All of our guests were amazed of how delicious the different cakes were. Abbey was so nice throughout the entire process. She hosted us for an amazing cake tasting. (So amazing that it was seriously difficult to decide only on 3 flavors.) We went with the Lemon Blueberry, Red Velvet and Hummingbird! I would try those out when you go in. She is a master baker are really knows her craft. If you are looking for someone that won't only make a pretty cake but that will also make you a super tasty cake then this is your cake person! Abby did a great job on our cake! It was beautiful and tasted incredible! We had lemon blueberry, chocolate turtle, and vanilla raspberry. There were only a few slices left at the end of the night! These company has the best wedding cakes in town. Our guests commented about how good our cake was. I highly recommend them! The wedding cake that we ordered through Wicked Cakes of Savannah was PERFECT! I knew right away that I wanted a naked-style cake and it had to be vegan. Wicked Cakes of Savannah was so accommodating and the cake was beautiful and delicious. I would recommend Wicked Cakes of Savannah to anyone!